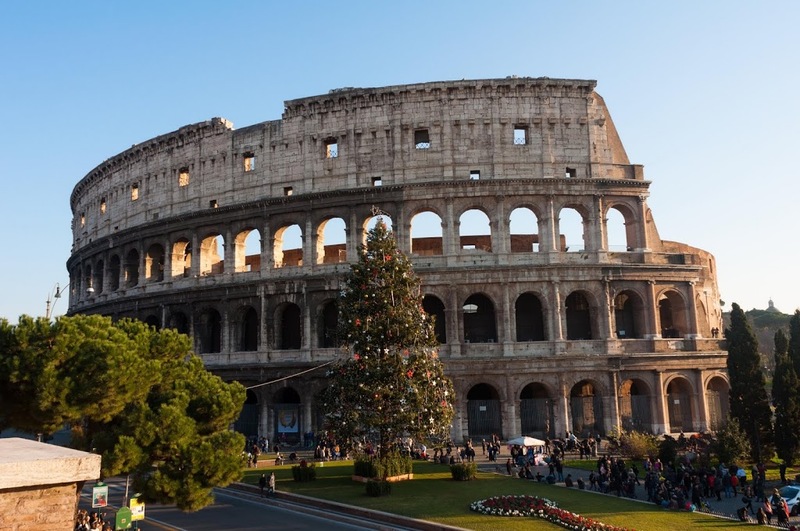 This year I came back to Rome right after Christmas. 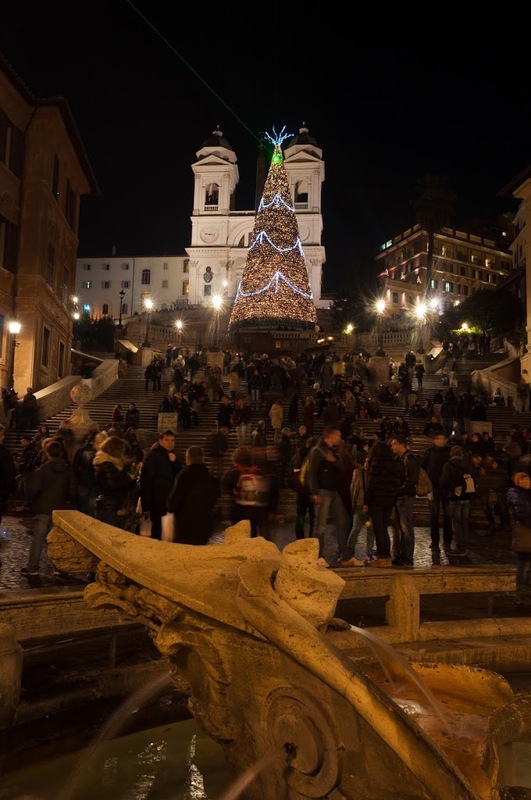 This allowed me to spend New Years with my sweetie and to see the holiday decorations in Rome that I normally miss. They strictly take them down after Epiphany. They put trees up in most of the big piazzas but their big thing are the Nativity scenes. We started with an old special Nativity that was made by the garbageman. 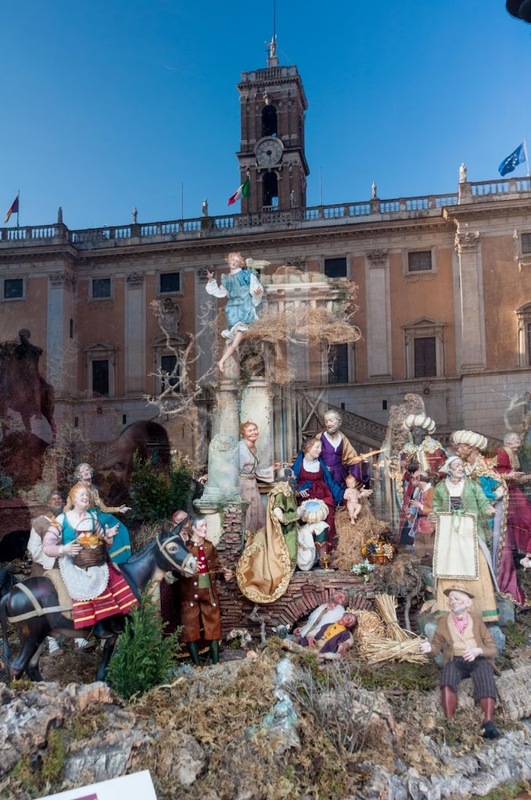 It is called the “Presepe dei Netturbini”. It is actually open all year long, so coming this time of year when there is a line to get in may not have been the best idea. 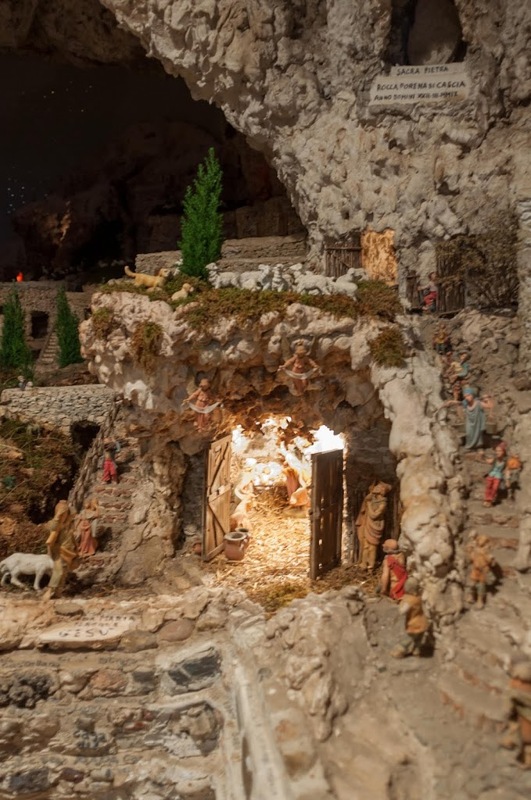 It is made to look like Jerusalem and incorporates pieces of rock from all over the world. 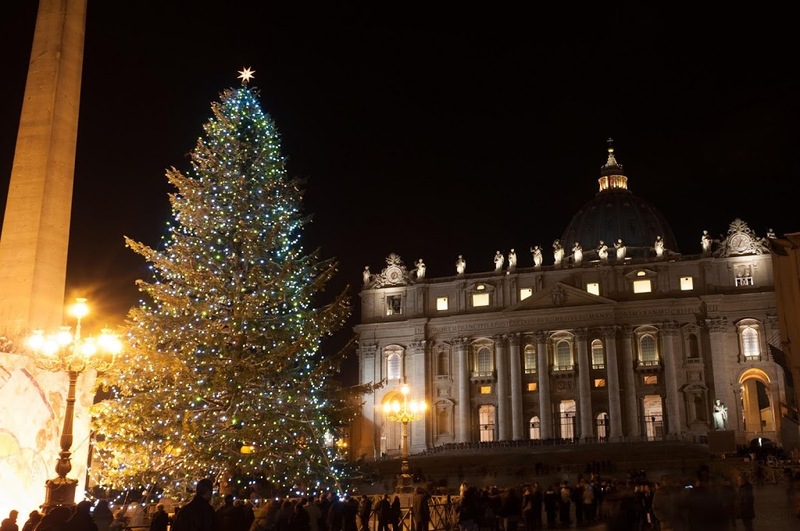 Next we went to Saint Peter’s Square (the Vatican) where they had both a beautiful tree and nativity. 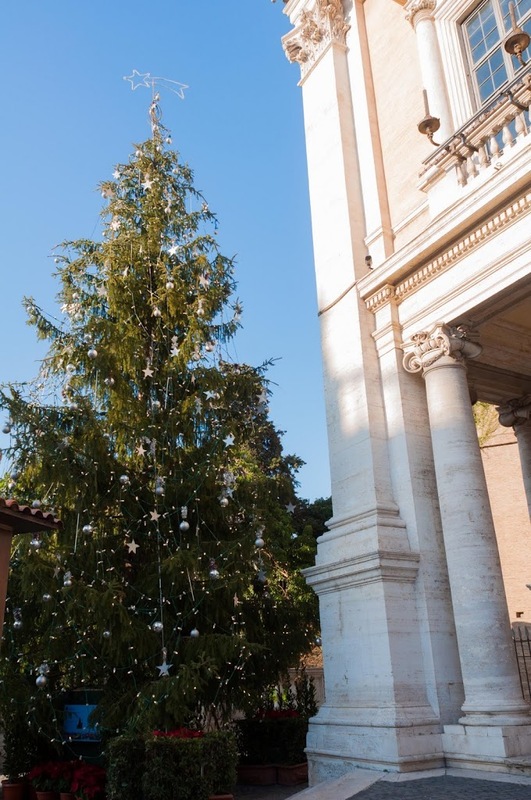 Different countries in Europe alternate donating the tree to the Vatican. This year the tree came from Southern Italy. It was lit during a ceremony on December 14th. After the holidays the wood is donated to several groups that manufacture toys for children in need. 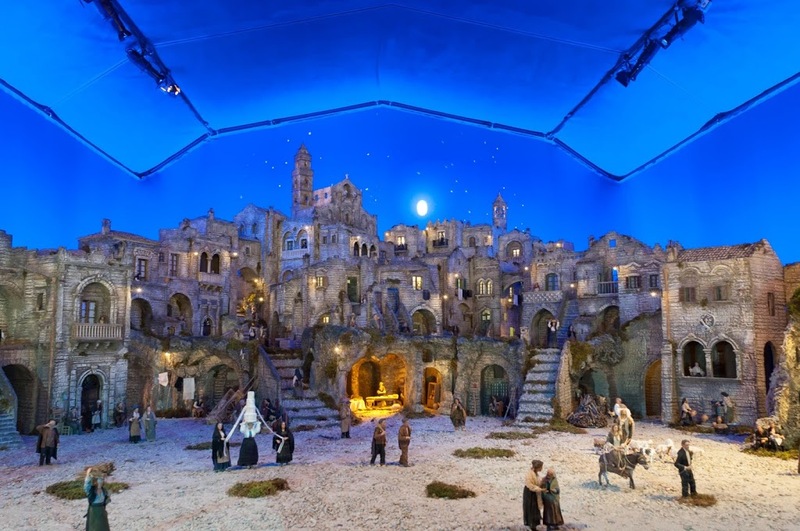 The nativity at Saint Peter’s Square this year was modeled after Basilicata in Southern Italy, from where it was made and donated. It was very impressive. It had just been revealed Christmas Eve. 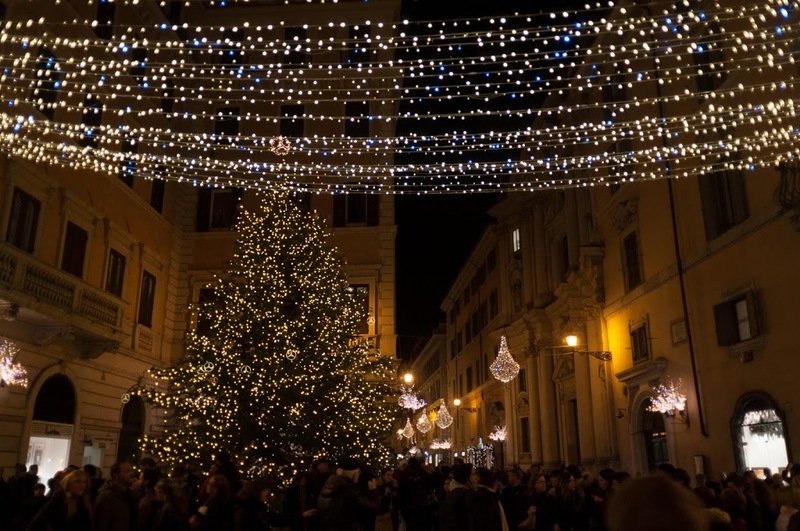 The city of Rome also decorated most of its streets with lights. 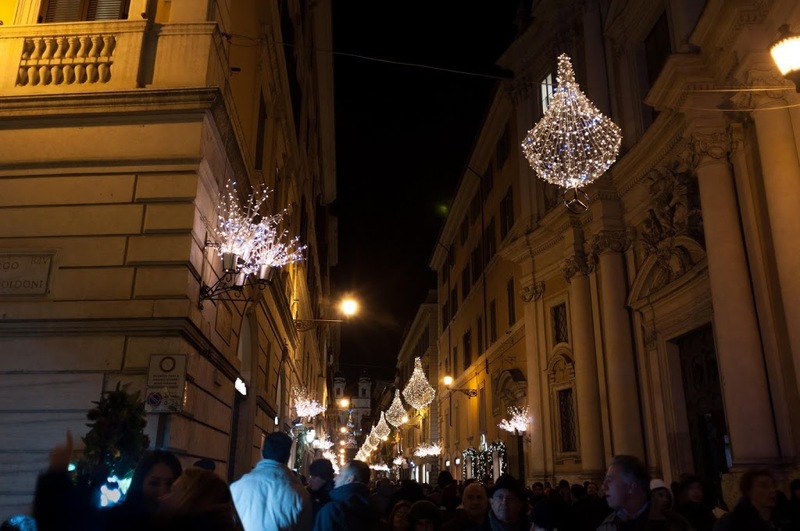 Including a ribbon of lights down Via Del Corso and lamps down the high-end shopping street Via Condotti. Different shops alternate sponsoring the lamps on Condotti, this year they were from Mercedes who also put up a tree at the head of the street where it intersects Via del Corso. Fendi, who have their giant store at the location also have a tree there made of baguette bags. Most of the little side streets in the historical center are decorated as well. 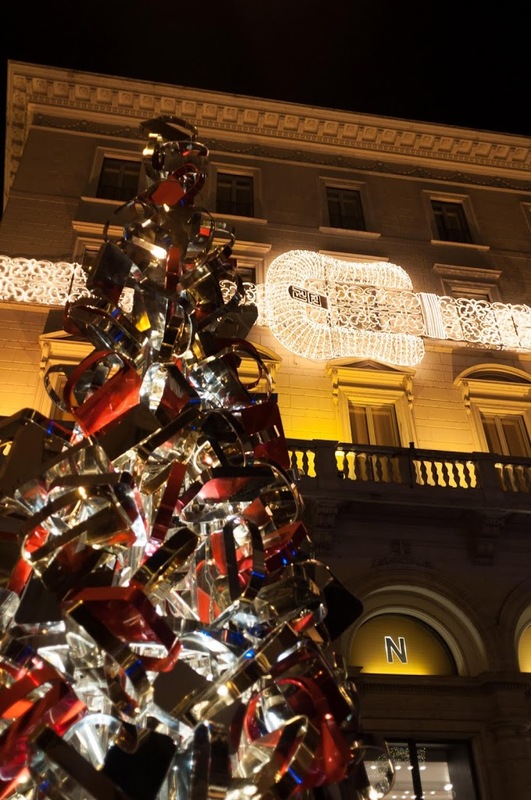 Mercedes lamps down the high-end shopping street Via Condotti. That’s the Spanish Steps at the end. Piazza del Spagna (Spanish Steps) was probably the most impressive. The church at the top was all lit up and there was a giant tree with a nativity below. Approaching it by way of the sparkling Via Condotti made it all the more magical. 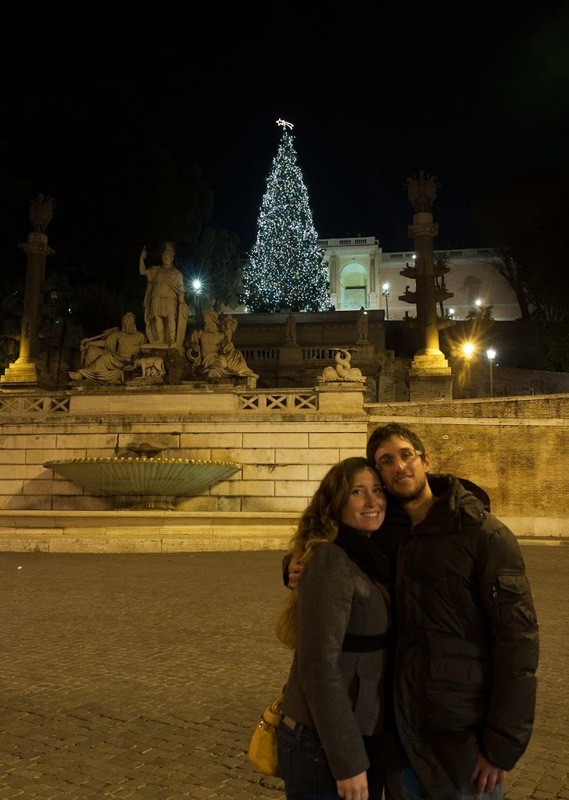 We didn’t think there was anything at Piazza del Popolo, but walking through there on our way home we found another tree! We came back for another round on Saturday, January 5. 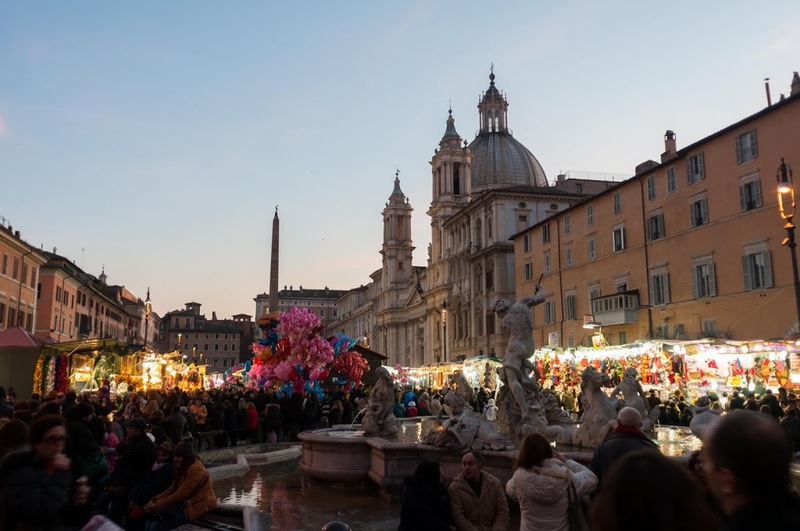 We still hadn’t seen all the big piazzas and that night they would be having Epiphany celebrations in Piazza Navona, so I could check that out, too. We started with Campidoglio Hill. They had a tree and a small detailed nativity behind glass. 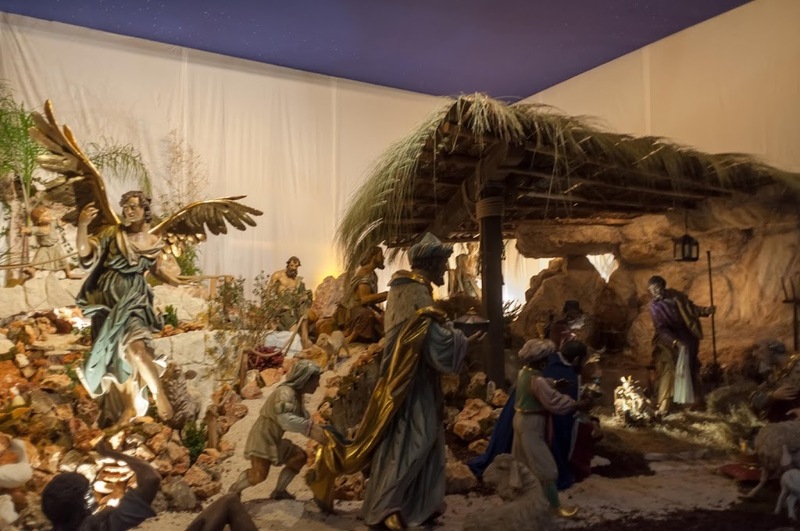 They were also setting up another life-size nativity that would be revealed the next day as part of the Epiphany celebrations along with a concert I gathered. But we weren’t free Sunday to come back. We went next to the Colosseum. I just can’t get used to turning a corner and seeing the Colosseum no matter how long I’m here. From there we headed to Piazza Navona where it was full of people. Full. Navona is possibly the largest piazza in Rome. It is the ovular one with the three fountains, the middle one is themed after the four great known (at the time) rivers. It is the one they used to flood and stage naval battles in– a big piazza. 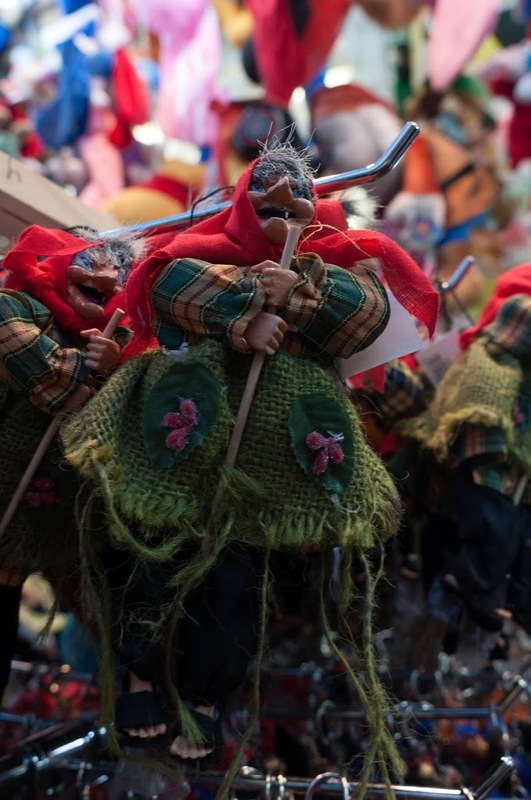 Along the sides there were vendors selling donut-like sweets and cotton candy, as well as toys and La Befana dolls. A side note on the history and Italian traditions of Epiphany. 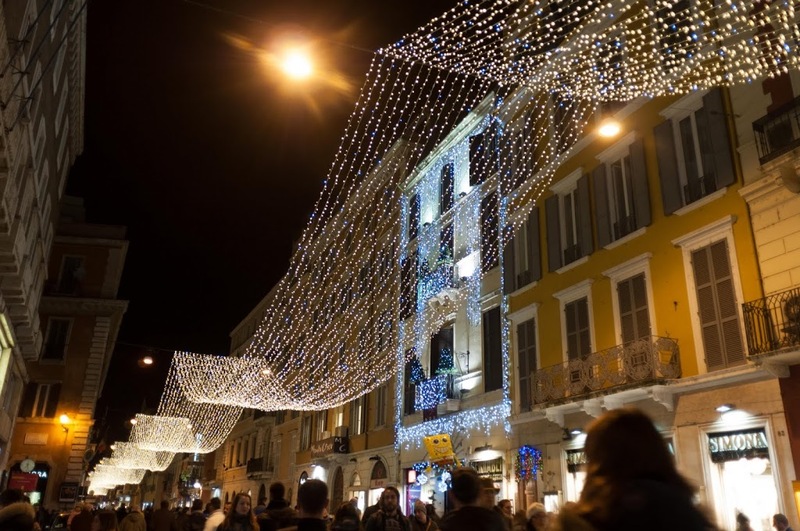 While in the United States the Christmas Season is unofficially observed from Thanksgiving to Christmas day, in Italy on the other hand it is very officially observed from Christmas Eve night through Epiphany (January 6). These “Twelve Days of Christmas” are a celebration of the period from Christ’s birth through the visit of the Magi / Three Kings / Three Wise Men. While you may have a Christmas party with coworkers or friends before this 12 day period, generally Christmas and its decorations and hoopla don’t ooze too much out of it. This period is almost immediately followed by the start of Carnevale celebrations, which we in the US are completely lacking or think of as a single Tuesday. Perhaps that’s why we like to make Christmas a month long. Italian Epiphany traditions are largely aimed at children, and having grown up in the US I can’t describe them first hand. What I have gathered is there is a type of witch named La Befana who is neither good nor bad. She enters children’s homes from the chimney and leaves them candy or small toys in their stockings; bad children get coal. A few days later we happened to be in Saint Peter’s Cathedral and we saw they had a Nativity set up inside besides the one set up out in the piazza. It was so crowded and the photo can’t do it justice, it was the most beautiful we saw. I simply want to mention I’m newbie to blogging and really loved this blog. Probably I’m likely to bookmark your site . You actually have terrific articles and reviews. Many thanks for revealing your web-site. Its like you read my mind! You appear to know a lot about this, like you wrote the book in it or something. I think that you can do with a few pics to drive the message home a bit, but instead of that, this is magnificent blog. An excellent read. I’ll definitely be back. We simply wish to show you the fact that I’m really raw to putting up a blog and utterly valued your report. Likely I am likely to bookmark your blog post . You certainly have outstanding article stuff. Like it for share-out with us your url webpage. Nice post. I was checking continuously this blog and I am impressed! Extremely helpful information specifically the last part :) I care for such info much. I was looking for this particular information for a very long time. Thank you and good luck. I merely have to inform you you which I am certain new to blog posting and clearly valued your website. Probably I am going to store your webpage post . You truly have extraordinary article stuff. Truly Appreciate it for expressing with us your website write-up. We just hope to inform you you which I’m just fresh to writing and genuinely loved your report. Probably I am prone to store your post post . You simply have excellent article writing. Be Grateful For it for discussing with us your site write-up.